George's generous gift. Photo by Noel. In honor of our recent obsession with ramen, we decided to go to Ramen Shop for our fourth Studio Crew Review. Our good friend (and amazing food stylist), George Dolese, generously welcomed us to our new neighborhood by treating us to dinner. We have all been hearing about Ramen Shop from our Production Assistant, Pete, ever since we moved to Oakland. Pete estimates that he has eaten there for dinner about 10 times in the past few months. So, who better to introduce the restaurant than the restaurant's biggest fan? When I began my search for the best ramen in the Bay Area I never guessed how far it would take me. Naturally I began close to home. I found ramen in my Outer Richmond neighborhood, then in different areas of San Francisco. When I felt I had exhausted my nearby options, I started looking further south. San Mateo had several good ramen shops, but it wasn’t exactly what I was looking for. In my travels, however, I had overlooked what turned out to be a very important direction: East. I finally found what I had been searching for nestled in a quiet neighborhood in Oakland. On a nondescript store front, a small sign reads, “Ramen Shop." It's a forthright name with little prelude to the beauty which lies inside. Patrons are greeted with traditional Japanese decor, complemented by large cedar beams and warm lighting. Ramen Shop boasts an expansive full bar, with an impressive selection of spirits and cocktails. Cozied up next to the bar is the open kitchen. This well-executed arrangement allows guests seated at the counter the experience of seeing the preparation of their meal. Cooks can be seen preparing each dish with care and expertise. 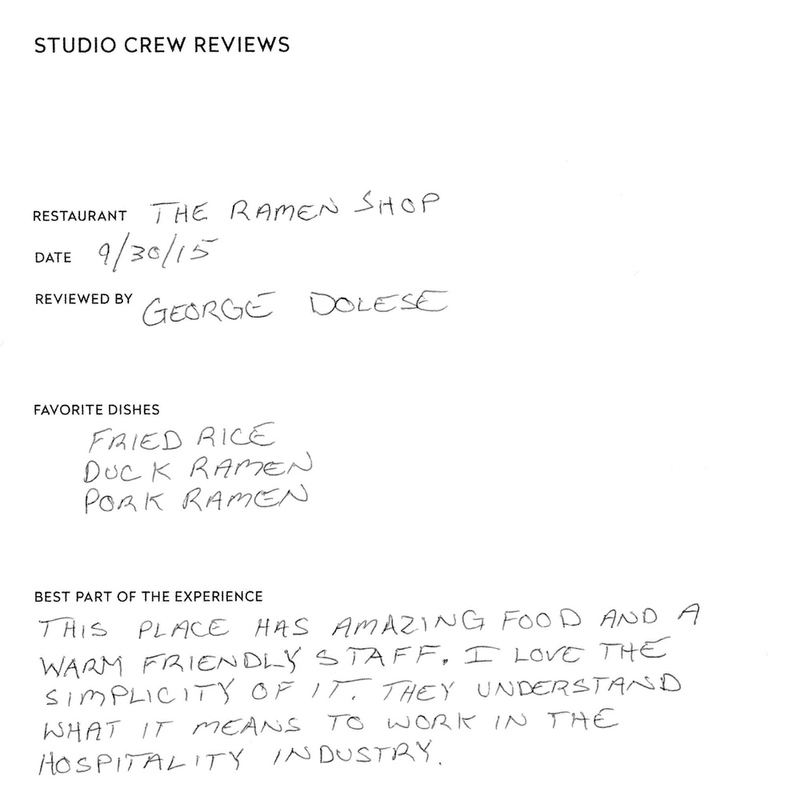 There is a sense of pride visible in the staff of Ramen Shop, which comes through in every aspect of the experience. Ramen Shop has a limited selection of ramen on their menu which is revamped daily. This being said, I have never felt as if I was being sold short. There is differentiation between the broths which allows each selection a unique taste. The noodles at Ramen Shop are absolutely superb. There is a distinct texture which is like nothing I have ever tried before. Their noodles have a certain firmness to them which differentiates them from other ramen. The chef behind the counter can be seen tasting the noodles as they cook. The noodles rely on the broth for flavor, and this is something Ramen Shop has down pat. The broth at Ramen Shop allows a multitude of flavors to be packed into one bowl. You will notice, however, that the flavors do not compete with one another. Spice does not overpower savory, sweet exists alongside salty. It is this absolutely fantastic attention to detail which puts Ramen Shop lightyears ahead. If you are a fan of good food, especially if you are a fan of ramen, you are going to love Ramen Shop. Menus and ambience. Photos by Sasha. Little Gem Salad. Photo by Cody. Squid and pork fried rice. Photo by Cody. Enjoying the Pickle Plate, Squid & Pork Fried Rice, and Little Gem Salad appetizers. Photo by Cody. Sasha enjoys her Hamachi plate, and the boys trying various bowls of ramen. Photos by Dana. Veggie Ramen. Photo by Pamela. A delicious meal with good company. Photo by Dana. Good news! After we all waited nervously for several months, Sasha's visa was finally approved and she'll be staying with us as digital technician supreme. To celebrate, Sasha's parents treated the studio crew to a special dinner. Sasha researched the many exciting restaurants in our new neighborhood before she selected Mua, a hip and trendy bar and restaurant in mid-Oakland. The restaurant offers vegan, non-vegan and gluten-free dishes, so there was something for everyone's tastes and dietary restrictions. Lush exterior of the restaurant. Photo by Sasha. Unique interior decorations. Photo by Sasha. Our first impression was that we loved the space. The exterior of this former warehouse is gorgeous, although it feels somewhat out of place surrounded as it is by car dealerships. Basquiat-inspired drawings and graffiti adorn the walls inside that retain the character of the former warehouse. There was ample seating, especially when we arrived at 6 p.m., but as the night went on, tables filled up. The restaurant was large enough to accommodate the crowd, however, and the service was always quick and efficient, so we never felt like our table was unattended. The studio crew. Photo by Pamela. Drinks and appetizers. Photo by Pamela. The strawberry lemonade was delicious, although a bit sour. We also ordered a variety of appetizers, including the grilled artichoke, chips & guacamole, "no-cheese mac & cheese," and Brussels sprouts. We enjoyed comparing ways to eat artichokes, but our favorite appetizers were ultimately the mac and cheese and the Brussels sprouts. The whisky tasting board. Photo by Noel. The upstairs loft had a DJ! Photo by Dana. The restaurant's sign is illuminated by a vintage spotlight. Photo by Pam. For our second Studio Crew Review, we decided to choose a restaurant that is within walking distance to the studio. FuseBox has gotten great reviews on Yelp (an average of 4 stars over 200 reviews), and it features fusion asian cuisine-- a combination of Korean and Japanese influence. As you read this blog post (and any future Studio Crew Reviews), you might notice a variation of photographic styles. Each review draws photos from each of the studio crew members, as we are all practicing photographers outside of the studio as well! On any given review, we will have a combination of photo taking techniques, ranging from iPhones to dSLRs. Dwell Magazine-esque exteriors. This restaurant can be easy to miss, as the only indicator of its street presence is the sandwich board advertisement on the sidewalk. Photos by Dana. Exclusive seating inside, with beautiful interior design. Photo by Dana. When we first arrived at the restaurant, it became apparent how small it was. The restaurant does not easily accomodate large groups, as most tables inside are arranged for 2-4 people, max. Outside, there was a large table that we were able to sit at. Since we had a reservation, we were quickly seated. Dehydrated Kimchi Popcorn, which unfortunately was a bit stale. Photo by Sasha. Service was a bit slow, considering that there were not very many people at the restaurant, but perhaps it felt slower to us because we were a hungry crew coming straight after work! As soon as we were seated, we poured over the menus. The menu was definitely geared more towards carnivores, as many of the "vegetarian" dishes featured sauces that contained meat bases. Pickled vegetables to accompany the main courses and the miso butter grilled corn. Photos by Noel. Appetizers, including the Korean Fried Chicken (KFC). Photo by Dana. One of our favorite dishes of the night was the KFC, we were surprised as to how crispy the chicken was, despite being covered in sauce. The chicken was crunchy on the outside, yet moist on the inside. We also enjoyed the Agedashi Tofu, although the portion was definitely too small to share with a group. Our waitress recommended splitting one main entree between two people to achieve the appropriate proportions. A table full of photographers requires patience. Photos by Pete. The exterior of the restaurant with the crew at the table. Note, there were no heat lamps, so we kept our jackets and hats on. Photo by Pete.